Checking/unchecking Enable keyboard shortcuts changes the preferences file to automatically enable/disable the shortcut mode when Chimera is next started. Other methods of turning accelerators on or off do not alter the preferences. Many accelerators are included with Chimera, and more can be added. They usually consist of two characters, but any number of characters is possible. Uppercase letters are sometimes used and are distinct from lowercase. Several provide capabilities not accessible through the graphical interface. Keyboard shortcuts are not entered in the Command Line except via the command ac. There are several ways to start Keyboard Shortcuts, a tool in the General Controls category. The resulting dialog lists the known accelerators along with brief descriptions. Clicking on an entry in the list shows a more detailed description (if available) at the bottom of the dialog. Filter list limits the entries to those containing the entered text. Enable keyboard shortcuts controls whether accelerators are enabled. Show main window status line controls whether a status line is shown under the Chimera window. Keystrokes interpreted as accelerators and messages reporting their effects appear in the status line. Load shortcuts file reads accelerator definitions from the Python file whose pathname is shown in the field below. New keyboard shortcuts can be added by putting their definitions in a Python file and then using Load. Key press time-out (seconds) (default 2) controls how long keystrokes that form part of an accelerator are remembered. Settings in the dialog are saved in the preferences file, except that the status of Enable keyboard shortcuts is only saved when the option is manually checked/unchecked by the user. Keystrokes may be interpreted as accelerators, as commands, or as information intended for other dialogs. Sometimes it is necessary to click in the graphics window or Side View to take back focus from some other dialog so that accelerator or command keystrokes will register. If accelerators are on and the Command Line has not been shown, keystrokes are interpreted as accelerators when the mouse focus is in the graphics window. When both types of input are enabled as described above, one must click in the graphics window to indicate that keystrokes should be interpreted as accelerators and click in the command-line area to indicate that keystrokes should be interpreted as commands. The accelerator hc hides the Command Line while the accelerator cl opens it and turns off accelerators. Keystrokes being interpreted as accelerators are shown in the status line; the time-out setting controls how long a partial accelerator entry is retained. If the wrong key has been pressed, simply waiting for the time-out period to elapse allows a fresh start. Alternatively, pressing the escape key clears the partial accelerator from memory. Finally, if no accelerator starts with the key that has been pressed, an “unknown accelerator” status message results and the keystroke is not retained. Completed accelerator operations are reported in the status line and Reply Log. within the Chimera installation directory. 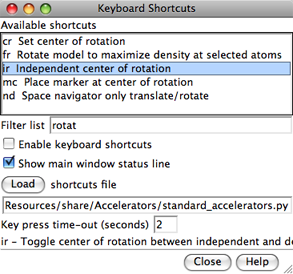 New accelerators can be added by writing their definitions in a Python file and reading the file with Load on the Keyboard Shortcuts dialog. The register_accelerators() function is called by the Accelerators extension. The first two lines load the standard accelerators. The next three lines define accelerators ry and rs to spin the models about the Y axis and to stop the spinning. The routines that spin and stop the spinning use the Chimera Midas module. The comment strings in the add_accelerator lines are the short descriptions that appear in the top part of the Keyboard Shortcuts dialog and, when the accelerator operation is performed, in the status line; the comment string within each function is the explanation shown at the bottom of the Keyboard Shortcuts dialog when the accelerator list entry is clicked. A click in the graphics window or Side View may be required. Sometimes it is necessary to click in the graphics window or Side View to take back focus from some other dialog so that accelerator or command keystrokes will register. “Off by one” situations can occur. Suppose sv (open the Side View) is intended, but “xv” is typed accidentally. If there is no accelerator starting with “x,” an “unknown accelerator” status message results and only the “v” is retained in memory. If sv is then typed before the time-out period has elapsed, the keystrokes will be interpreted as the accelerator vs (show volume) and another “v” is retained in memory until the time-out period has again elapsed (or the escape key is pressed). Accelerators are not shown on menu entries, nor are they available for all menu functions. Potential improvements include showing accelerators on the corresponding menu entries to make them easier to learn, and defining accelerators for more menu functions.